Are in the market of a Wii, a second Wii, or a replacement Wii? Well have a I got some good news for you. 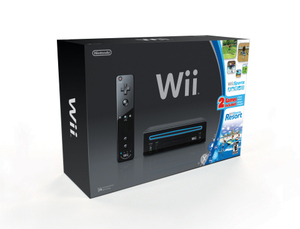 Nintendo is releasing a new Wii bundle as an attempt to make one final push on Wii sales before the Wii U ships. This new all bundle will be replacing the current system that comes with New Super Mario Bros. Wii. This system will include a black Wii, black Wii Remote Plus and matching Nunchuck controller, and both Wii Sports and Wii Sports Resort on one disc (both fancy and convenient). The best part of this, the new system is going to retail at $129.99. While stores are already getting the new console you can expect it to be widely availble by 10/28/2012 (Nintendo has a thing for Sundays it would seem).